The Sinn 556 A Red Special Edition has all of the great features that have made the Sinn 556 A among our best selling Sinn watches, but with the red seconds hand offers a bit "more attitude". The Sinn 556 A Red Special Edition features a satinized case at 38.5 mm. This finish results in a slightly more polished look while at the same time retaining some characteristics of a matte finish. In addition, the dial features the layout used in the famous Sinn NaBo navigation timers and clocks. "This put my Audemars Piguet in the drawer"
Verified Owner Comments: I could not be happier with this purchase. I was wearing my AP Royal Oak as my everyday watch, the 556A Red has taken over that spot. Better than chronometer accuracy (+3.5 sec/day), and perfect size for my 6.75 inch wrist. The dial is very legible (one of my main motivators for purchase) without the watch being too big, and the simplicity is timeless. I chose the red seconds hand over the white, I'm glad I did. It really pops, and adds to the legibility. I'm waiting to get the silicone strap for this as it's currently sold out, but I've been wearing it with an assortment of different NATO straps. It's actually a very cool look that I may stick with for a while. As my with all my watches, I never take them off (shower, pool, ocean, daytime, nighttime). The looks good with casual and formal attire. Sporty Swiss quality without the price tag. "I love my Sinn 556A Red Special Edition"
Verified Owner Comments: I was attracted to this watch when received WatchBuys notification that the price of Sinn watches were going to increase. 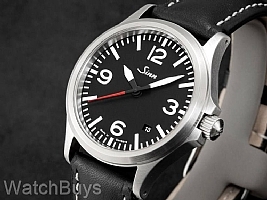 Earlier this year I bought my first Sinn watch a limited edition 103 Sa B E that I love. I was attracted to the simplicity and size of the 556A, and I have not been disappointed. I love the watch. it has been a long time since I have a watch that is this small, and I love the way it wears and looks. The quality and build of the watch is excellent. The simple design is very compelling. It is easy to read, and it has all the information that I want from a daily wearer. I is a casual watch, and it also dresses up very well. Verified Owner Comments: I spent years buying and trading watches. I had a 566 before and traded for something else. I finallly bought the 556A again. Nice watch. Perfect size. German engineering. Perfect for every day wear. Super value for the price. Watchbuys are great to do business with. "Sinn 556 A Red Edition"
Verified Owner Comments: Ok love the watch , it’s sits a little small on my wrist but it compliments when i wear a dress shirt . It sits right under my cuff. I’ve gotten compliments on the piece wish is cool didn’t think anyone would notice. Im not a watch expert at all , but it seems the watch is well made and will last me long time. Now on to the bad. I haven’t really worn the watch much because the band is too small. I’m only able to go to the first hole . Second hole to tight, what to do dying to make it my everyday watch but can’t. Been meaning to call WatchBuys, just haven’t had time. Hopefully they have solution. It’s not a cheap watch not use. Verified Owner Comments: This is my first Sinn watch and I love every aspect of it, from the perfectly legible dial to the rock solid construction, from the nice red second hand to the sapphire crystal case back and the 200m water resistance. A very high quality watch at a very affordable price. Verified Owner Comments: I've owned a few 556, but I really love the 556A with red seconds hand. It's the perfect all-around watch. I'm not a fan of the matte finish on many of the other Sinn models, but this one really suits me well. Verified Owner Comments: I was drawn to the simplicity of the 556a for a few years before purchasing, but I was instantly hooked when I eventually noticed that a red second hand option was available. Watch: High legibility, large and symmetrical 12, 3, 6, 9 hour numerals, thick minute and hour markers, discrete date window, wide handset, matte black dial with the final accent of the red second. The classic case with drilled lugs are lovely too. The luminous material is dimmer and of shorter duration than my 857, and EZM13. The dial needed to be replaced, but Sinn replaced it and WB conveniently arranged a local watchmaker to install it under warranty. Verified Owner Comments: Beautiful, accurate timepiece. Bought this to wear while my Submariner is in for service. Accuracy is impressive for a non-COSC watch. Have been tracking accuracy since FEB 17th and so far it gains an average of 2.4 secs per day. "Bought a grail watch without knowing it." Verified Owner Comments: This watch is amazing. The dial readability in my opinion can not be surpassed. The Red second hand gives it a very nice accent and it helps time things under a minute, since you know what is seconds and what is hours and minutes at a glance. I also went for the 556A version due to the black mat finish of the dial which is the same finish as the black parts of the hands. This gives the sensation of the hands floating over the dial which does not happen with the 556 I version. The movement is beautifully decorated with blued screws and Côtes de Genève on a golden roto with the Sinn logo . Mine runs +1.9 sec/day which is incredible. Also doing business with WatchBuys is a pleasure. Verified Owner Comments: Love the material, construction and simplicity of the watch. Looks great. Will be wearing it as an everyday watch. Can dress up or down with different straps. Red second hand makes a subtle but big difference in the look of the watch. Very happy with the purchase and the purchasing experience. "Great Fit For My Smaller Wrist"
Verified Owner Comments: I also have the 556i. 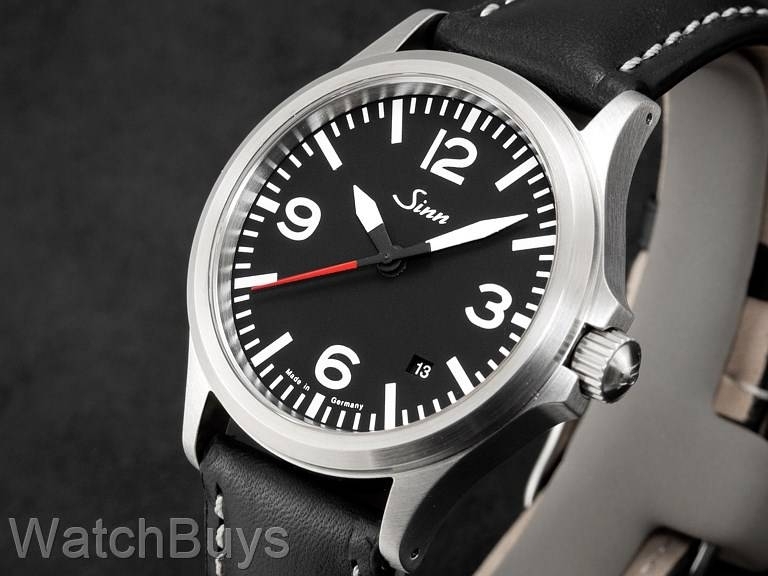 The Sinn 556A Red Special Edition has a bit of more utilitarian look due to the numerals and the black matte dial. Although having a diameter of 38.5 mm. this watch appears a bit larger than the 556i due to the numerals I believe. The red second hand is a nice touch. I think that this watch works in about any situation including dress. Verified Owner Comments: I chose my Sinn Special edition 556 A with red second hand, due to its simple elegance and rugged construction. The second hand really pops and is easily read. The lumi glow numerals are a bonus as well. I had looked at this watch and had decided it was the best option for my budget. Since its initial wind and wear. It has keep impeccable time with out any loss +\- . I'm glad I purchased this excellent watch and recommend others to do the same.